A2 Hosting started way back in 2001. Formally known as Iniquinet, this independently owned web host claims to be 20x faster than other competitors. They offer a 99.9% uptime guarantee and have data centers all around the globe in US (Michigan), Europe (Amsterdam) and Asia (Singapore). Let’s not forget they offer 24/7/365 ‘guru’ support – surely there’s got to be a catch? It’s all sounding pretty good at the moment! A2 Hosting’s shared hosting starts from £3.05 per month and increases to £7.26 per month for their most expensive Linux plan. Windows plans are available too, should users want to browse these. 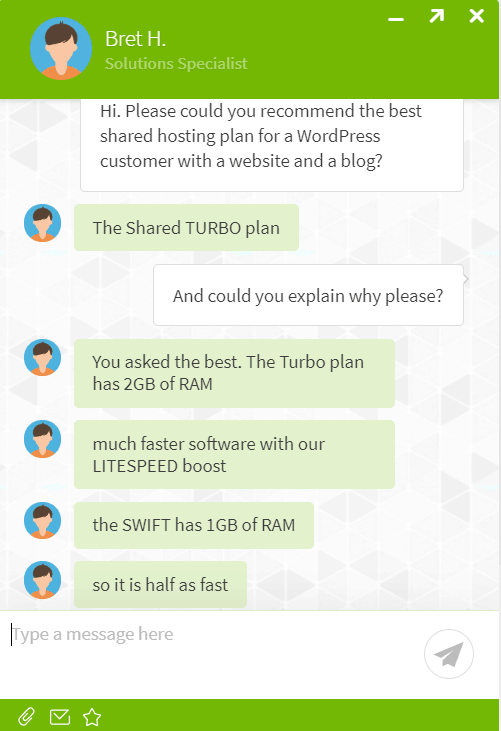 As A2 Hosting suggests, their Lite plan is great for single websites. Packaged with 5 databases, unlimited storage, unlimited bandwidth, cPanel, and a free SSL certificate. If after all that you’re not happy, there’s an anytime money-back guarantee – that’s very reassuring! Cranking things up a little, for less than 80p extra at £3.82 per month, users will enjoy pretty much-unlimited everything! This plan is great if you’ve got more than one website, or perhaps a website and a blog, or even a small online store! Remember I said A2 Hosting boasts they’re 20x faster than other hosts? Their Turbo plan is £7.26 per month and includes A2 Site Accelerator and pumps 20x performance into their servers. A2 Optimized is a cPanel plugin which is exclusive to A2 Hosting. The plugin offers pre-configured caching to ensure your website and pages load faster. Turbo cache: Every HTML aspect of a webpage will be stored without running an PHP scripts. This provides up to 20x faster speeds across page loading times. OPcache/APC: According to A2 Hosting, OPcache can cut PHP page response times in half. The knock on effect of this is of course an increase in page speed. Memcached: This feature will increase the speed of MySQL databases. The most important data from your databases will be kept in memory for faster retrieval. A2 Hosting offer a multitude of web hosting options, including VPS, reseller, and dedicated hosting. They also sell domain names and other solutions to create the perfect website in one package! HackScan: This handy (free) feature adds security measures to your website in order to keep hackers away. It includes a dual firewall, virus scan technology, and security monitoring. The beauty of A2 hosting is that they don’t just chuck stuff at you with no explanation. They give you tools that are actually useful and beneficial, without interfering with website performance. Site Migration: It’s free! Yes, site migrations are free with A2 Hosting. I’ve really never understood why web hosts charge for this feature! If you’ve had web hosting with another provider and want to transfer your files and data over, A2 Hosting will help with this. 1-click Installs: As with most web hosts that use cPanel, you’ll have access to a world of apps. These include CMS platforms like Joomla, Drupal and WordPress. What’s more, if you install WordPress, you’ll automatically gain access to the A2 Optimized WordPress plugin – for free! CDN: Cloudflare’s Content Delivery Network (CDN) comes free with A2 Hosting packages. You can experience faster site speeds, better security, and even enhanced uptime, absolutely free. A2 Hosting gives their customers a 99.9% uptime guarantee. This falls in line with most other web hosting companies, but gives their customers the confidence that their web servers won’t fall below their SLA. I monitored my own website hosted with A2 hosting to share with you my experience. I’m happy to report that over the period of 1 month, my website had a 99.96% uptime result. Although it’s not a perfect score, it meets A2’s SLA and is better than the average uptime of 99.94%. There was a total downtime of 13 minutes, across the period of 1 month, which in fairness isn’t too bad at all. Yes, there are other web hosts where I’ve experience 99.99% uptime, and even 100% uptime, but overall these results are pleasing. That averages out at 368ms which is incredibly impressive! In fact, it’s around 50% faster than the industry average. It really goes to show that if a web host is willing to put in a little extra research or effort into their technologies, it can really pay off. Things like offering a CDN to their customers has taken A2 Hosting from being a good web host to a great web host. Reducing loading times for users is a sure fire way of encouraging customers to continue using A2 Hosting for their web hosting needs. You can contact A2 Hosting’s customer support through a variety of popular channels. You can submit tickets to individual departments, like sales, support and billing, or simply call them or chat to them via their website’s live chat service. Their FAQs and knowledge base offer a world of helpful resources. It’s quick an easy to access this information and I haven’t come across something which I haven’t found an answer for! A2 Hosting’s approach is definitely beginner friendly, but at the same time, they don’t forget the professionals either. I mentioned earlier that A2 Hosting is user friendly. It’s certainly easy for beginner to grasp, and I really noticed this whilst processing my own order. There’s a 3 step sign up, which doesn’t differ much to other hosts. This is great, because you don’t want to spend hours filling out information just to get to your account! They offer a variety of payment methods, and there doesn’t seem to be any hidden fees or clauses. They make it clear that it will cost a little to downgrade your plan or move data center’s, but upgrades aren’t a problem. Once you’ve signed up, your account is instantly activated. You can move your files across straight away, start from scratch, and start installing your favourite apps. I hate waiting around, especially when it could be hours before you get to launch your website! Customer feedback is very important for any business. It’s also helpful to us as users to gain an idea of what others think about a company. After all, I could think a web host is great, but the rest of the world could think differently! That’s why all of my reviews are unbiased and I try and look at the facts! A2 Hosting’s Facebook page has nearly 50k followers! Looking at their reviews, they have 4.7/5 star reviews which is really impressive for that amount of users. 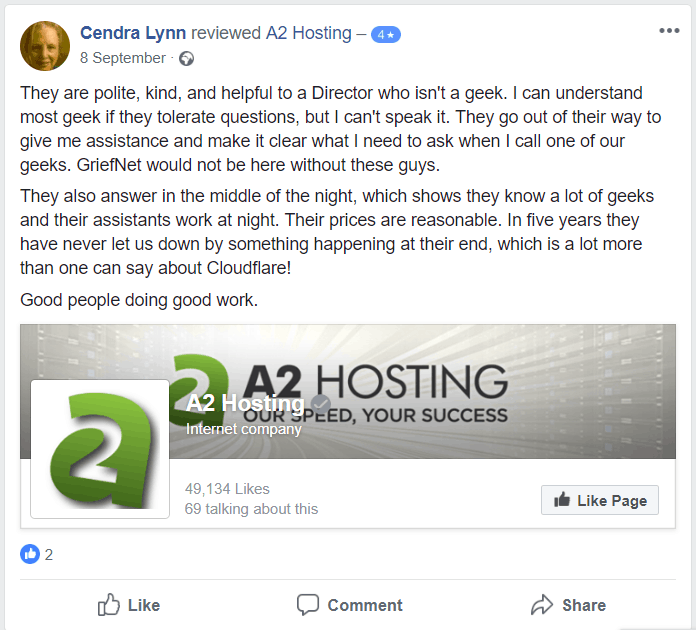 The reviews on their social media pages are very positive, and go into detail about A2 Hosting’s dedication and customer service. Their 10k following on Twitter also reports positive reviews. These kinds of reviews support my own feelings about A2 Hosting – I’ve always had a good experience with their support staff, and my servers’ performance has definitely met my expectations. Green Hosting: A2 Hosting is an advocate of green energy! They’ve partnered with Carbonfund in order to reduce their carbon footprint. Now, I realise this isn’t necessarily what every customer might look for in a web host, but I think it displays a great level of consciousness. A2 Hosting clearly care! SSD: Solid state drives (SSD) are recommended above traditional hard disks as they perform better and faster. A2 Hosting plans all use SSD which can even improve the load time of your website. RAID 10: RAID (Redundant Array of Independent Disks) 10 is a brilliant backup system. If one of the disks fails, there’s 9 more to rely on in order to store your data. The failed disk is replaced and the data is shared across multiple drives to make this web host extremely reliable. The features included in each plan are really great – this web host has definitely taken the step to put their customers first. They’ve also taken note of the big players in the industry and have tried and successfully competed with them. With brilliant performance statistics (the best I’ve seen), an uptime guarantee, and loads of options when it comes to your website, I’m struggling to find many flaws with A2 Hosting. However, you are looking for all of the above plus amazing customer service then my personal recommendation is SiteGround (they’re amazing). You can read the review here.